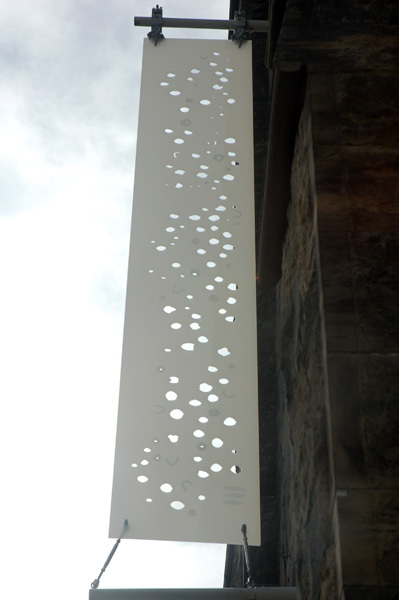 This new work is from a commission by Peebles Creative Place 2014 for the Eastgate Theatre and Arts Centre, Peebles to create drawings using imagery from the north atlantic salmon using natural light effects to incorporate the piece into the landscape. In the panels I have tried to convey something of the mystery and occasional visibility of the salmon on its journey from Greenland to the River Tweed. This work is an exploration of the boundaries between the handmade and the machine made using the lasercutter as an innovative drawing tool. This has been an opportunity to use opal cast acrylic as the medium for the two drawings. The two acrylic drawings, Peel 1 and 2, are named after a reference in the Border Ballads where a peel is a pool.